Dolma (pl. dolmas or dolmades) is a family of stuffed vegetable dishes in the cuisines of the former Ottoman Empire and surrounding regions, including Turkey and Cyprus, the Balkans, many Arab countries, Iran and the Caucasus and Central and South Asia. Dolma is a verbal noun of the Turkish verb dolmak "to be stuffed", and means simply "stuffed thing". Dolma, strictly speaking, is a stuffed vegetable, that is, a vegetable that is hollowed out and filled with stuffing. This applies to courgette, tomato, pepper, eggplant and the like; stuffed mackerel, squid and mussel are also called "dolma". 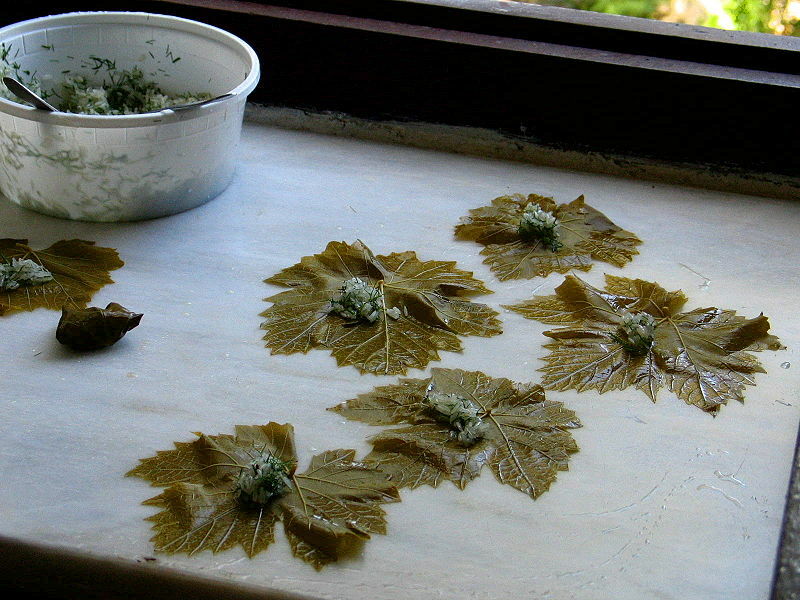 Dishes involving wrapping leaves such as vine leaves or cabbage leaves around a filling are called 'sarma' though in many languages, the distinction is usually not made. Sarma is derived from the Turkish verb sarmak which means to wrap. Other variants derive from the Turkish word for 'leaf', yaprak. 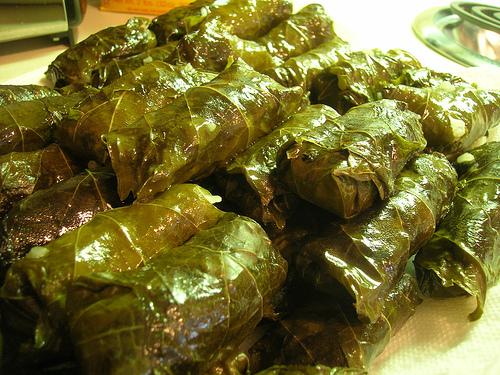 Perhaps the best-known is the grape-leaf dolma, which is more precisely called yaprak dolma or sarma. Common vegetables to stuff include zucchini, eggplant, tomato and pepper. The stuffing may or may not include meat. In either case, the filling includes onion, parsley, herbs and spices. Meatless fillings are cooked with olive oil and include raisins, nuts or pulses. Meat dolma are generally served warm, often with sauce; meatless ones are generally served cold, though meatless dolma are eaten both ways in Iran. Both are often eaten with yoghurt. In Cyprus stuffed vine leaves are called koupepia (Greek). Greek Cypriots call the rest of the stuffed vegetables either gemista (which means something stuffed in Greek) or dolmades (as a plural for dolma). When they stuff with spices and rice, they call them pseftika (fake) and this is done either for fasting or especially when they stuff zucchini flowers. In Armenian cuisine, minced lamb meat or beef is mixed with rice and wrapped into grape leaves (tpov tolma - թփով տոլմա) or occasionally in cabbage leaves (kaghambi tolma - կաղամբի տոլմա). This dish is condimented with coriander, dill, mint, pepper, cinnamon and melted butter. Sometimes chestnuts and peas are part of the mix. Yogurt with garlic is often used as a sauce. Eggplants, potatoes, tomatoes, peppers, onions, quince and apples are also stuffed with lamb meat or beef and also called dolma. Echmiadzin tolma utilizes eggplants, green peppers, tomatoes, apples, and quinces. There are varying styles of how dolma is made.